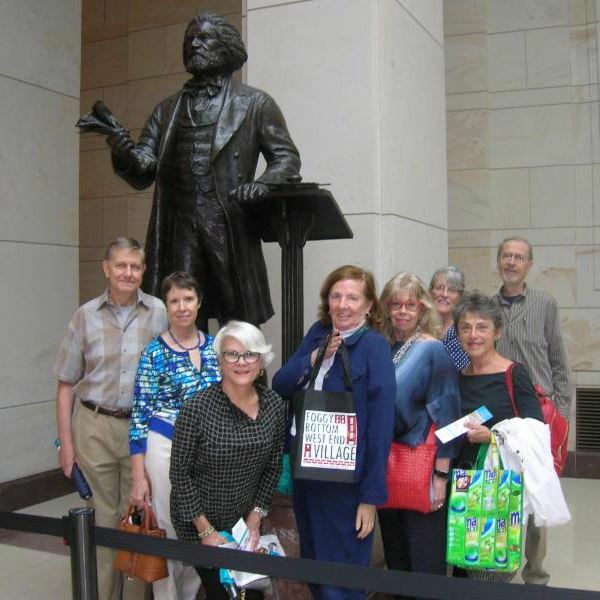 A number of Villagers experienced an “insider’s” tour of the US Capitol on Friday morning, August 6. Our guide was Jay Pierson, who retired after 40 years of service at the Capitol working primarily for the Republican leadership, many of whom became Speakers. Jay took Villagers to places not included on the public tours, including the Speaker’s private office, conference room and veranda (where views across the mall are those Presidents now have when taking their oath of office), as well as the House floor and adjacent coatroom where members relax when not on the floor. His insights and anecdotes were informative and delightful, and his enthusiasm for the institution and its history were contagious. Jay was especially pleased to tour with visitors who were so aware and informed about U.S. history.